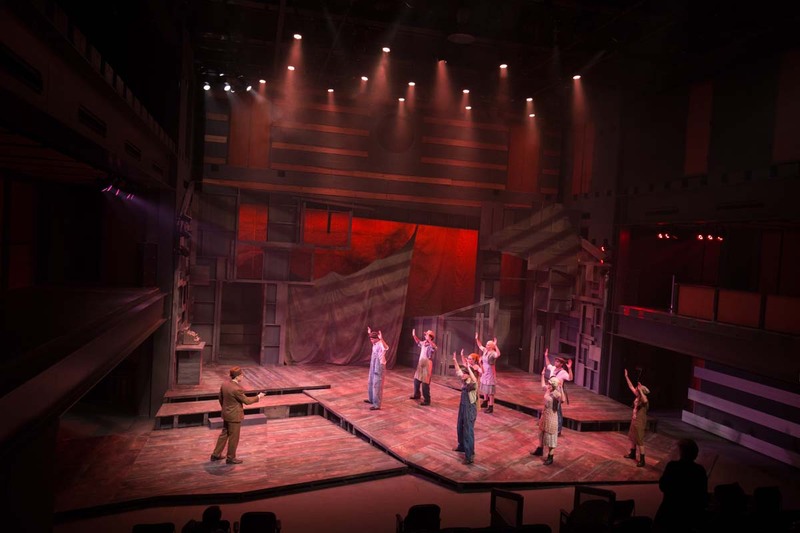 The Jands Vista system was used to control the lighting & visual media elements for Texas-based WaterTower Theatre’s spectacular production of Bonnie and Clyde. 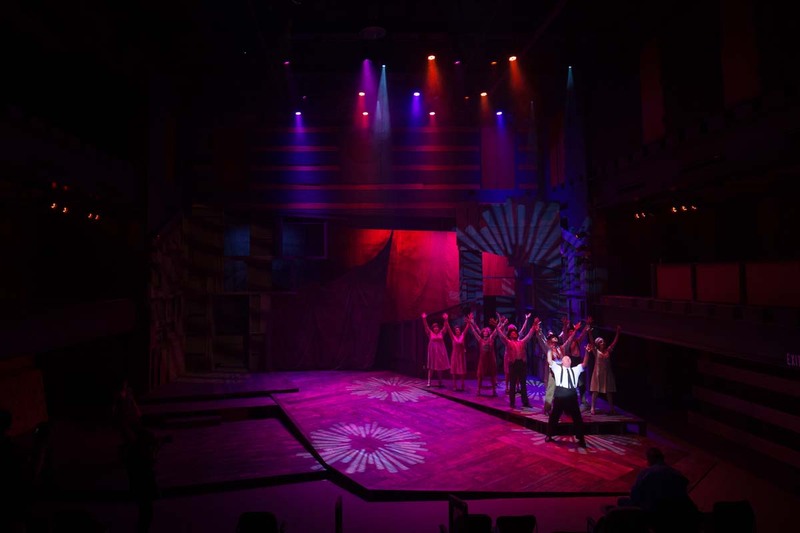 Founded in 1996, the multi award-winning WaterTower Theatre is a not-for-profit professional theatre company in Addison, Texas. 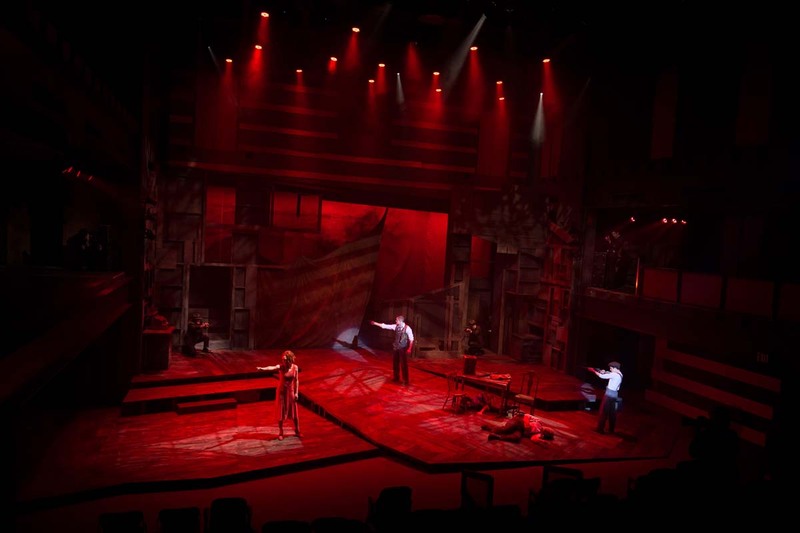 It produces six main stage shows each season in its flexible, state-of-the-art facility, which is part of the Addison Theatre Centre. The Centre already owned two Jands Vista consoles – the ultra-compact M1, and the original Vista T2 model, but recently added the range’s flagship L5 console to their inventory. Dan specified a fairly large rig for the show, which included Elation Design Spot and Power Wash fixtures, Chroma-Q Color Scrollers, and K-9 Pup and Bulldog fixtures. One of the major successes of this production was the inspired projections and visuals. These were created by set designer, Sarah Brown, working closely with in-house technical coordinator, Scott Guenther, who did the media design for the projection surfaces. “The projections were handled by ArKaos MediaMaster Pro 4.0 software running on a Mac Pro, with two projectors. A Panasonic TP-DW830 8500 lumen projector was used for the center hanging cloth and a BenQ SH960 5500 lumen projector for the rigid side projection screen,” says Scott. The Jands Vista consoles and the ArKaos MediaMaster Pro 4.0 software were demoed and sold to the Centre by North American distributor, A.C. Lighting Inc. The Addison Theatre Centre is currently celebrating its 21st anniversary year of providing live theatre to the Dallas area, and has won numerous major awards in this time. The Jands Vista console range and ArKaos Pro media servers hardware and software line-up will be showcased at PLASA Focus, Orlando, in February on the booth of exclusive North American distributor, A.C. Lighting Inc. (booth 413).